Active and passive solar systems equipment - that hardware and elements which capture the sun’s energy for heating bath and wash water; heating swimming pools for extended season use; generating electricity to power devices; cooking food; warming and cooling buildings, etc. 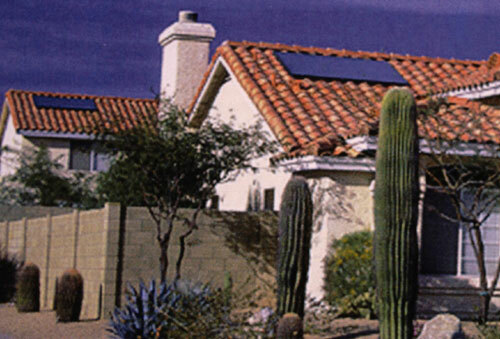 Solar equipment use is growing in Arizona neighborhoods, cities and towns. Buildings are incorporating solar as part of the basic equipment package. People want to use solar equipment because it is cost effective, resource saving, simple to use and understand, and there is a logical, direct and unencumbered energy resource in the sun as it moves across the sky. Solar equipment which provides for a building’s performance and the residents needs, is no longer some “future” thing - Today, solar elements and panels are part of the mainstream with other element of in the building equipment palette - electric service and distribution; gas meters and pipes; water meters and piping, water heaters, fire sprinkler systems; waste water pipes and vent stacks; air conditioners; evaporative coolers; heating systems; television receivers and connections; phone lines and junction boxes; etc. All these systems are integral elements of a buildings’ operation in meeting human needs as well as comforts. To this list, and in many cases, replacing some items on the list, Arizonans are incorporating solar devices, equipment, and design elements. Reasons for this incorporation may vary - from saving money to saving the environment, and the applications range from use of a solar hot water heater to photovoltaic panels to cool towers. Just as in the use of any other type of equipment, the use of solar can have a direct impact upon a building - its’ performance, its’ look, even its’ form and shape. At the same time, the building also has an impact upon the optimal use of solar strategies and equipment used - affecting both placement and performance. 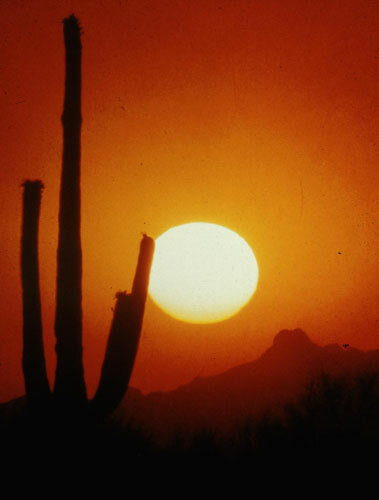 To assist Arizonans in the use of the sun as another element of the citizen’s energy mix, the State of Arizona has enacted legislation that clearly stipulates that there can be no prohibition to the use of solar energy. This legislation has the intent and effect of both encouraging as well as protecting Arizonan citizens right to solar utilization. 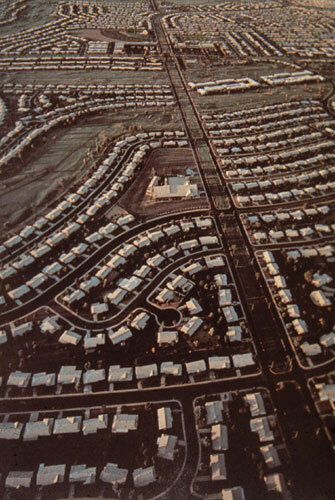 As Arizona’s population and economy grow, there is also growth in the building market. Increasing numbers of people means more buildings, and meeting the need for more buildings results in developments and subdivisions. These developments reflect the public’s desire and demand for neighborhood identity and integrity, and to this end developments often have defined conditions of building and site appropriateness, identified as Covenants, Conditions and Restrictions. Historically, CC&Rs were drafted to mitigate, among other things, unsightly installations of roof-mounted equipment of television aerials, evaporative coolers and heating/air conditioning equipment and unkempt yards and properties. 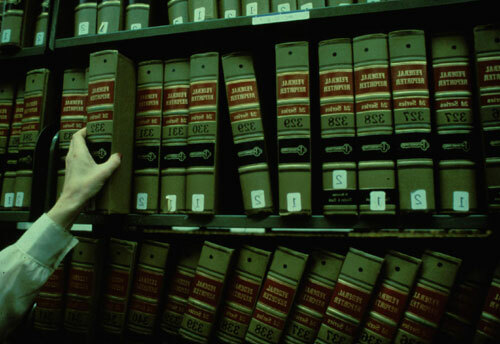 Definitive CC&R’s established an aesthetic standard in order to maintain visual integrity, which was believed to be a primary element in maintaining property value. 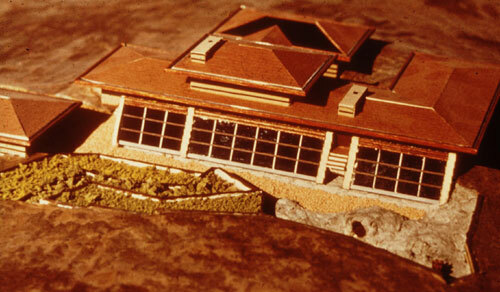 Some of todays CC&Rs have precise definitions down to building style, materials, and even color. Unfortunately overly restrictive CC&Rs promote situations where all buildings look alike and there is no visual interest and disallowance for variation, reducing a neighborhood “look” to one of sameness and boring homogeneity. 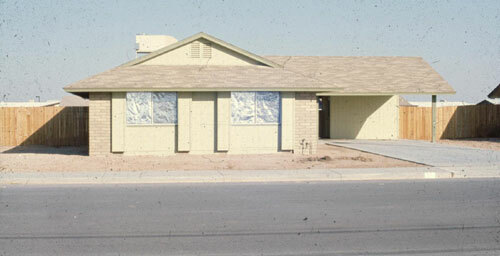 Today, subdivision requirements have a common restriction - generally, no equipment visible on a building, most notably the roof. In order to maintain an aesthetic of clean lines and building form, equipment such as coolers, air conditioners, and television aerials must be located elsewhere or be visually screened. This prohibition accomplished its’ original purpose in screening or removing unsightly mechanical equipment from the skyline and placing it out of view. 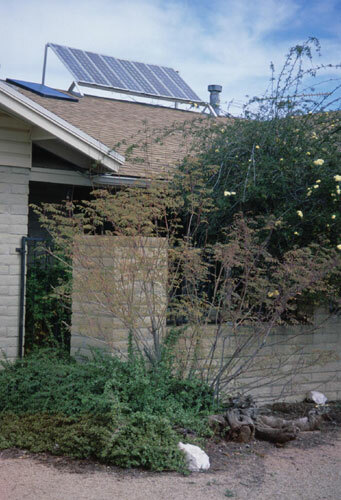 Unfortunately, this “no equipment on the roof” restriction comes into conflict with optimal conditions of solar equipment placement, effective solar equipment utilization, good solar design, and sometimes is even in direct conflict with Arizona law encouraging use of solar energy. 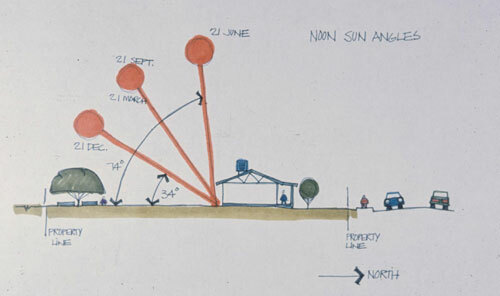 Ideally, the installation of solar equipment should be achieve optimum performance for the Owner, but restrictive CC&Rs have negatively impacted performance by forcing placement of equipment in situations of limited exposure to the sun; locations that require longer runs (of piping, wiring, etc.) 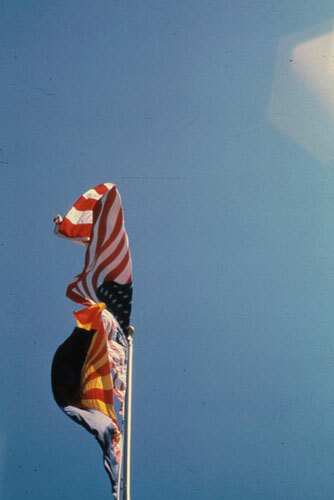 than necessary; locations which require restrictive, and sometimes costly, screens; and/or placement of equipment in less than optimum exposure angle to the sun, each and all of which provide less than optimal results for the building owner. 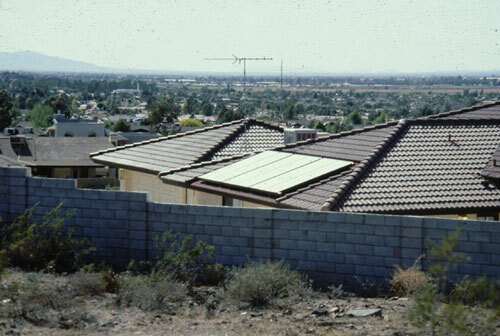 Recently, in litigation involving a Home Owner Association’s (HOA) attempt to restrict residents use of solar equipment on building rooftops (the only, and most effective, place it could be used), Arizona courts ruled against the restriction, and reinforced the solar rights of Arizona citizens. 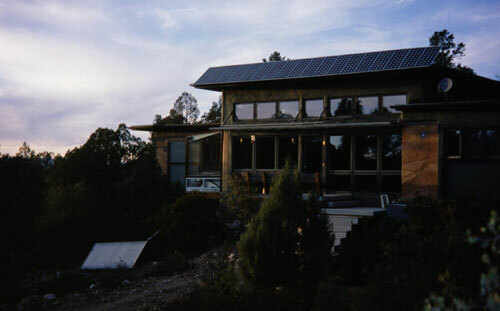 Additionally, the Arizona Solar Energy Industries Association (AriSEIA), has initiated workshops and activities with HOAs throughout Arizona to provide effective and appropriate definitions and implementation of solar equipment incorporation standards, in order mitigate future conflicts between homeowners and HOAs, and to meet State legislative intent. To this end, the Az. Department of Commerce Energy Office has supported AriSEIA in this endeavor, and continues to be a resource for Arizona citizens. The desire for optimum equipment performance of equipment often results in the need to mitigate site specific conditions through additional structure - mounting solar panels on racks for proper tilt angles and exposure. These racks, placed on roofs for optimum exposure, have come under fire and rejection from Homeowner Associations committed to maintaining the aesthetic qualities of the neighborhood. 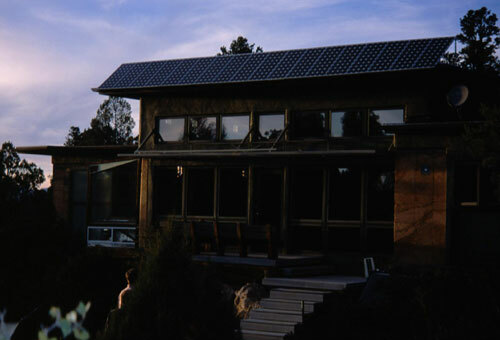 While effective in establishing proper orientation and attitude of solar panels toward the sun, these installations project a discontinuity with the building design and are perceived by many as ugly and unsightly appendages to otherwise attractive buildings. 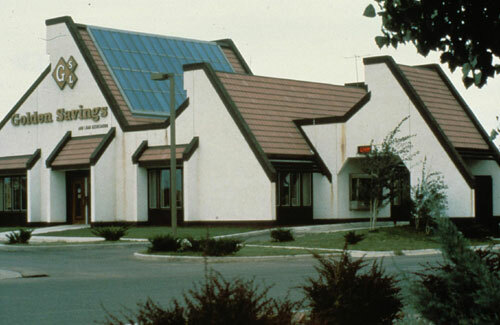 Today’s subdivisions have fallen into stylistic characterizations (Santa Fe style, California tile roofs, etc.) 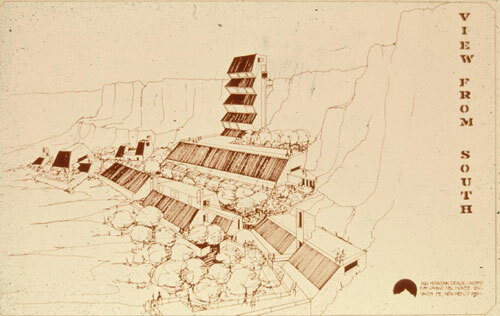 instead of evolving from appropriate environmental response which would result in a truly Arizona style. 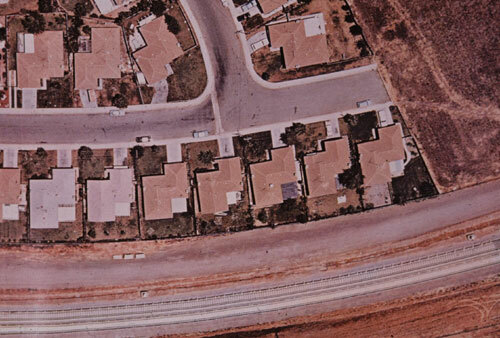 Subdivisions are laid out with numerous considerations - density, views, circulation, etc. 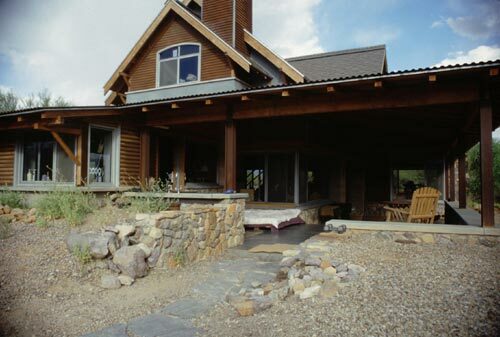 with little or no consideration is for basic tenets of good energy, solar and environmental design. Energy issues are met by adding insulation and efficient mechanical systems without consideration of using positive aspects, or mitigating negative impacts of the site and the climate to reduce both the amount of equipment used, and the amount of energy required to run it. 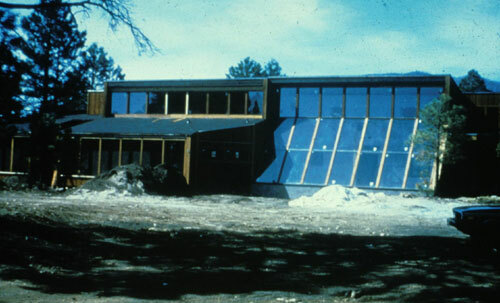 Effective energy benefiting actions involving orientation, building shape, space planning, amount of glass, and/or incorporation of active and passive solar and energy efficient equipment as part of the building shell are overlooked. 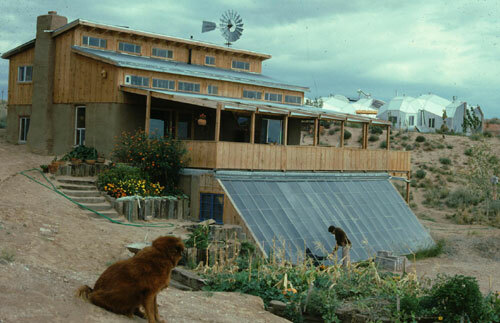 Desert houses face west into the intense sun; roofs are flat in snow country; inordinate areas of glass wrap buildings forcing residents to take defensive measures; and building forms and structure do not readily allow for integration of solar equipment as part of the building’s fabric. 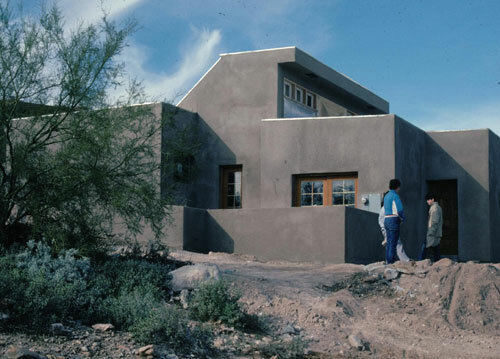 While the idea and ideal of maintaining a neighborhood character and quality is desirable, current design and construction practices make integration of solar strategies and equipment problematic, and when coupled with CC&R restrictions regarding solar equipment, provide conditions for conflict, penalties, litigation and unhappiness - all which are counter to the heart of a neighborhood environment and value - one of belonging and being a part of shared community, and being able to use Arizona’s most prevalent resource - the sun. Solar integration is easily implemented in the design and construction of a new building - equipment and element incorporation can be executed to make the project a seamless and integrated “whole”. Proper building orientation and siting can be determined. 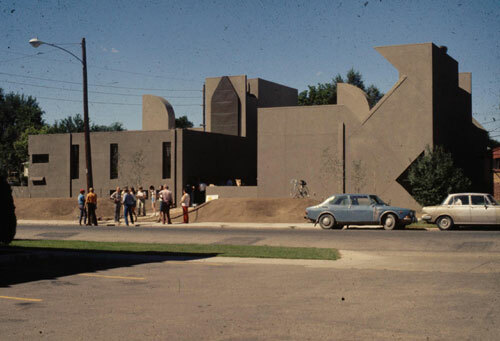 Appropriate building form can simplify the incorporation of equipment into the structure. Proper space planning can optimize the distribution systems related to solar equipment use (piping, wiring, etc.). 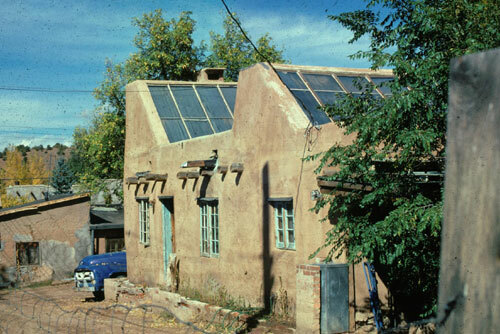 More problematic is the integration of solar devices and elements into the existing Arizona building stock. 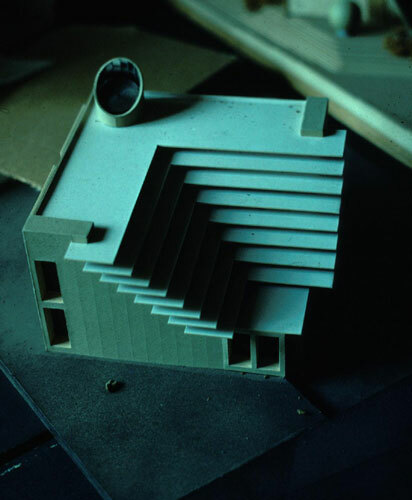 Existing buildings come in an array of orientations, forms, roof shapes, construction and materials - some very compatible with use of solar strategies and integration of equipment, and others contrary to good solar design posing problematic conditions for the building owner wishing to use solar. 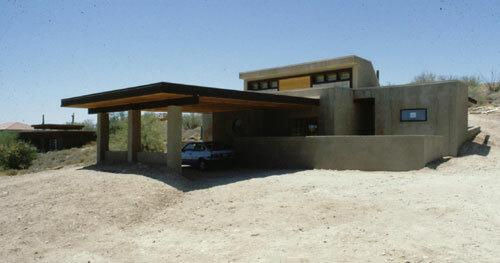 Even award winning Arizona architecture suffers from this poor consideration, with glass walled boxes in the dessert. 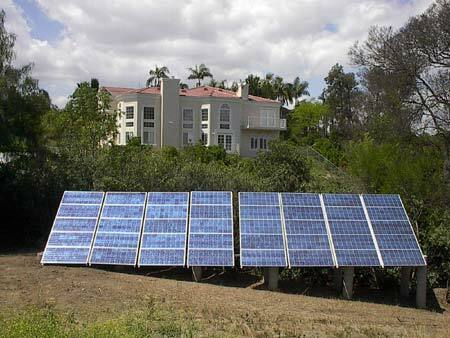 Sites may not have any appropriate location for a solar installation. 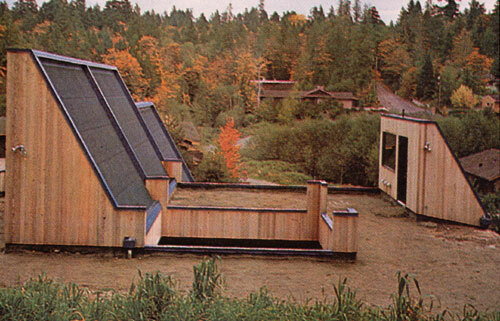 Building roofs may not have appropriate angle or orientation to the sun. Restrictive CC&Rs may prohibit the placement of equipment on a effective south facing roof, or require screening that may effectively reduce equipment performance, or force placement of equipment in locations which effect performance. 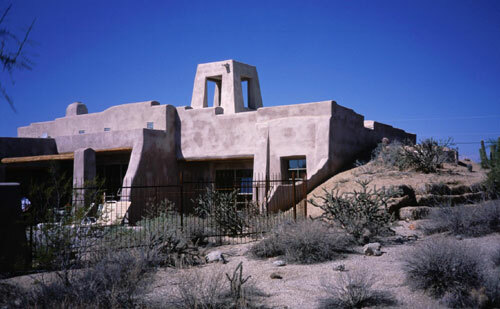 Whether it be new or old buildings, Arizonans respond positively to the idea of an integrated “whole”. 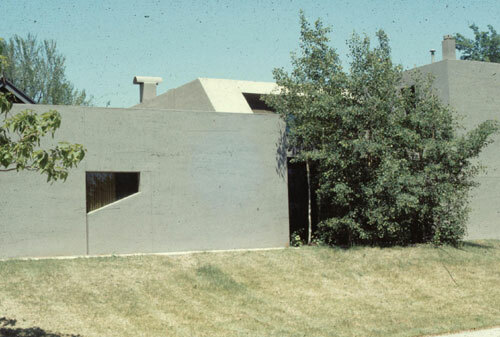 Additions and renovations that provide a visual continuity are more readily received and enjoyed than those projects which have additions are perceived as unsightly because of their incompatibility of form or integration. 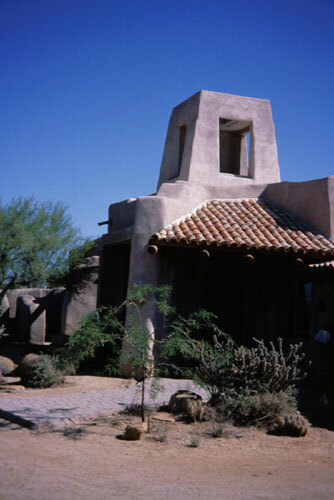 What is needed is a result which meets both the functional requirements of the equipment and aesthetic sensibilities of the people, providing the best for Arizonans and Arizona architecture. 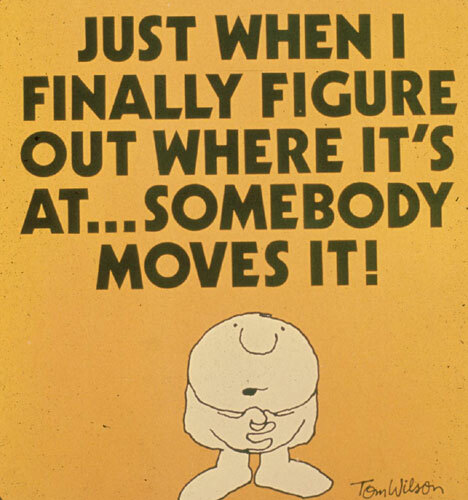 Of course site and situation, and type of system play a role in where equipment winds up. A passive thermosiphon hot water system with separate storage may have a lower location for panels than a hot water heating system which uses pumps, which would allow for panels to be placed on the roof. Photovoltaic panels may be fixed systems integrated into a sun struck roof, or be ground mounted for ease of access or for use with a tracking system. The sun’s movement is in a predictable pattern. As the earth makes its annual elliptical trip around the sun, its axial tilt provides for the seasonal changes in the northern hemisphere. The summer sun is high overhead and its appearance and impact are longer in duration and more intense during summers, whereas the sun’s appearance is shorter in duration and lower in the horizon as it traverses the winter sky. 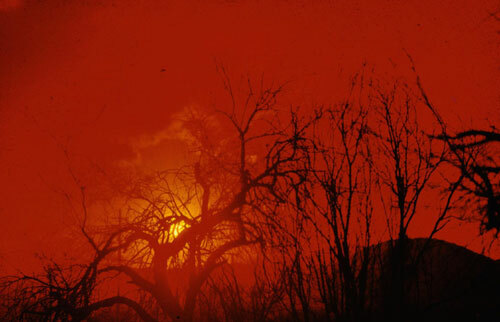 Like all applications that use the sun’s energy, exposure is a primary and critical element. While simple direct exposure will get results, ideal positioning provides the optimum performance of any piece of solar equipment, whether it is a solar water heater, a photovoltaic panel, a solar cooker or even a passive solar heated building. The 3 primary aspects of optimizing performance of solar equipment are uninterrupted exposure to the sun through orientation; appropriate angle to the sun (tilt angle); and effective placement. Maximum performance of solar equipment and passive heating strategies is based on continued exposure to the sun. Outputs are optimized when there is clear connection to the sun for the entirety of daylight hours - the more exposure to the sun, the more water can be heated, the more electricity generate, and the more heat can be generated for comfort. Collector locations must be face the sun’s path as it traverses the south sky, free of shade, for the entirety of daylight hours. 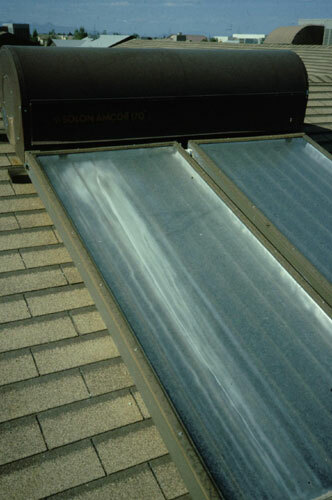 Solar water heating is most effective when it can provide hot water under coldest conditions - i.e. winter. 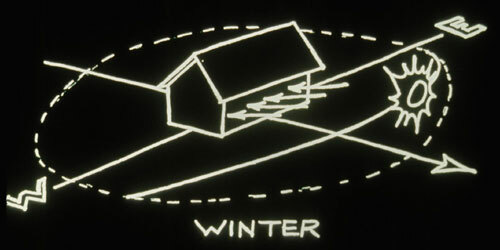 The winter sun is lower on the horizon so the ideal angle of a collector should more vertical (to 45 degrees). Solar pool heating is more in demand in the colder parts of the year so this angle of exposure can be equally important. Solar cooking in the winter is more effective. 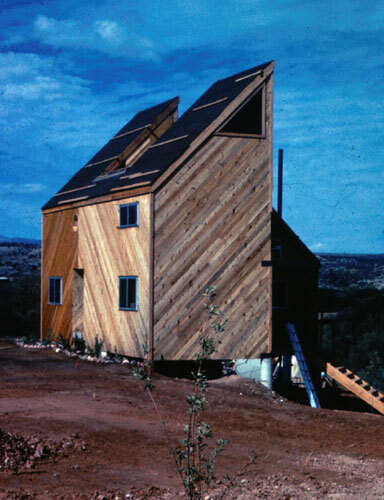 This tilt angle is a very necessary condition for optimizing solar equipment use. 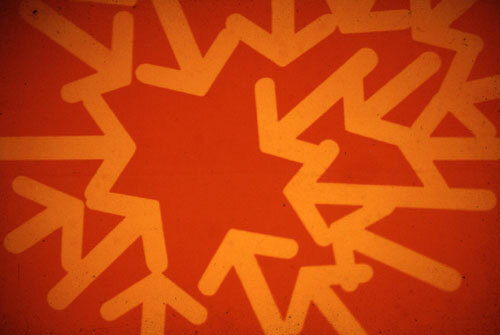 Positioning and orientation have significant impact upon the performance of any system. For example an array of PV panels tilted to the sun produces over 50% more electricity than one, which is simply vertical. Location of equipment is a critical consideration. 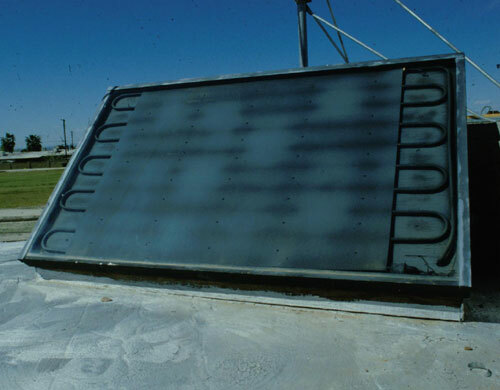 Placement optimizes conditions by having short runs of delivery - water heated by a solar collector should have as short a run to the storage and/or use as possible to minimize transfer heat losses. Electrical installations benefit from short delivery systems. Reduced runs mean less material, less labor and materials for installation, less maintenance in the future, and less overall cost. An additional benefit of solar equipment placement is one that directly impacts the shape and form of a building, adding visual interest as a byproduct of the solar functionality. 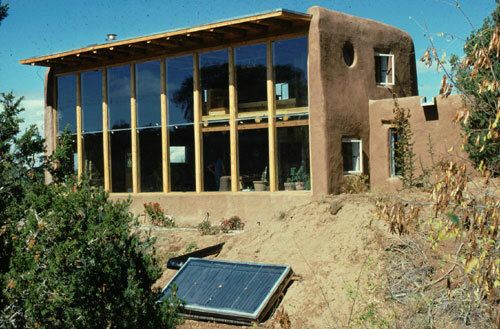 Passive solar buildings take their form and shape from the direct relationship in using nature’s resources. Axial elongation along the East/West axis to provide more southern exposure and minimize unwanted east and west exposures to intense summer sun; roof forms and/or elements which incorporate solar equipment and strategies; specifically calculated overhangs to protect from summer sun high in the sky while allowing for the access of lower angle winter sun; vertical forms of cooling tower projections; recessed windows and doorways for thermal tempering; and colors and textures which enhance taking advantage or mitigating conditions. Implementation of solar equipment and solar strategies have a range of options, from integration on site to integration as part of a building. 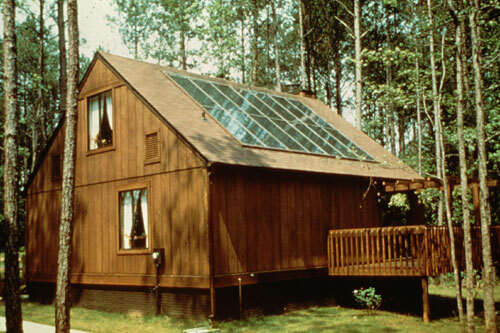 Currently, there are 2 major pieces of solar equipment - solar water heater systems (panels, piping, storage) and photovoltaic panels (electricity generation from sunlight, wiring, electrical equipment, electrical “storage” for off grid installation) , with a number of other pieces of solar applications like cookers, roof ponds, thermal chimneys, cool towers, etc. 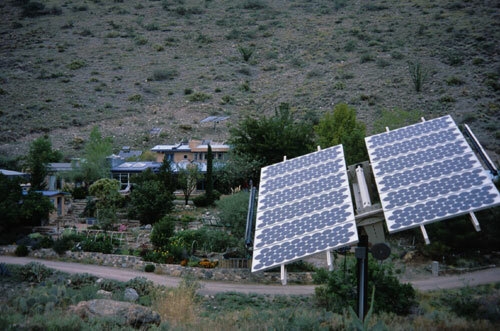 In some cases, if there is appropriate access to the sun, ground mounting has been used successfully in Arizona for fixed photovoltaic panel arrays as well as individual panels on trackers, which follow the course of the sun to optimize operation. Panels mounted in open areas on a site allow for freedom of operation and movement necessary for a tracking system, and/or for ease of installation, access for maintenance and adjustment for both tracking and fixed systems. 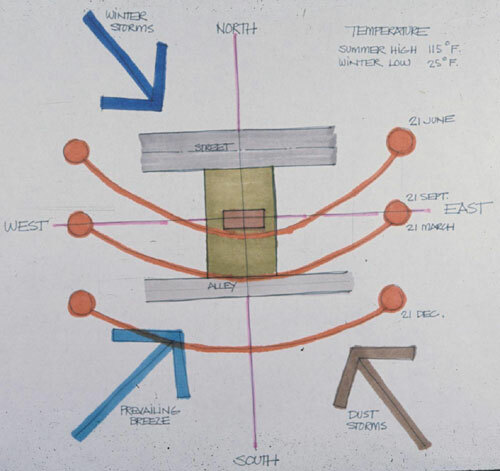 This may also be an appropriate integration strategy for passive hot water heating systems, which use non-mechanical thermosiphon circulation methods for heating water for personal use, or for use in radiant heating of floors. 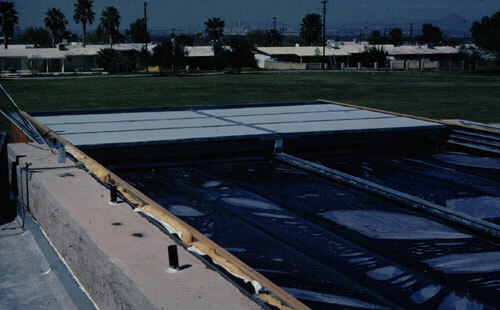 Since hot water rises, and cold water settles, the thermosiphon water heating system has water, heated by the sun at the collector, naturally rising to a storage tank or through radiant heating pipes embedded in floors, and the colder water from the storage tank or the floor system, is circulated back to the panel. 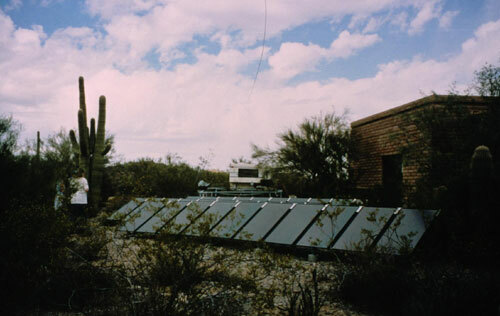 This convective loop runs continuously as the sun shines and works well as long as the collector panel heating the water is below the level of the delivery or storage system. Some applications with south sloping sites, place collector panels below the floor level of the house to capitalize on the thermosiphon effect of this passive approach. 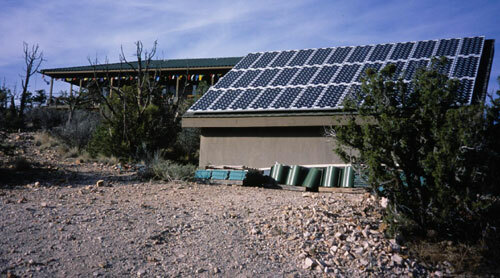 In these ground-mounting applications, solar equipment is located in response to the ease of location, ease of access, and direct and easy maintenance or in response to the terrain, type of equipment, and end use - sloped site integrating a passive thermosiphon water heater with end use being heating of a building and/or for domestic purposes. 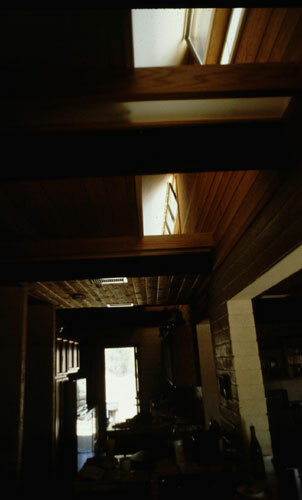 Some such installations have integrated equipment as part of a building element such as a porch or deck. In all cases, proper orientation as well proper tilt angles can be easily achieved, thereby having equipment operate at its optimum in providing electricity and/or hot water. 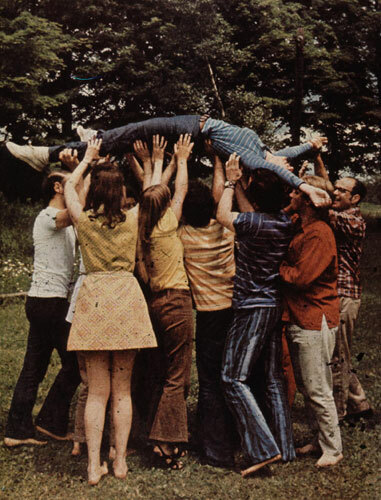 Sometimes, equipment is mounted on, an adjacent structure. 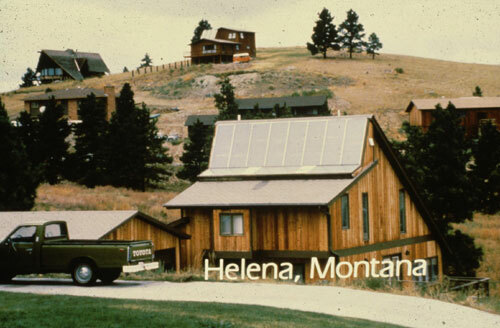 Photovoltaic systems that are completely off-grid and provide for the entirety of electrical service of a house require an extensive amount of batteries in order to store enough electricity for nighttime and overcast day usage. Use of batteries entail the need for an extensive amount of space as well as an area that is well ventilated in order to dissipate the hydrogen gas that is formed. Some applications provide a dedicated structure for this purpose and incorporate the photovoltaic panels and equipment such as inverters into the structure, thereby minimizing runs between panels, inverters, and storage. Solar water heating systems used for heating pool water in order to extend the swimming season, can be incorporated into trellis and shading structures that are part of a patio and pool area. Since there is no necessity for storage (the pool water is heated directly) this provides a direct connection with short runs and minimal line loss inefficiencies. Equipment can be mounted directly on the building as a separate element or appendage. While solar elements can be attached to any part of a building that has good southern exposure to the sun, the most advantageous location at the roof. Roofs generally provide a condition of unencumbered and unshaded access to the sun’s path, and the location puts equipment out of the way. 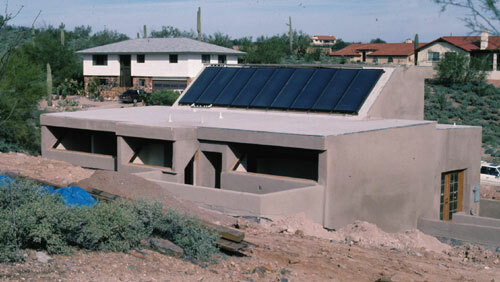 Additionally, a roof application can allow for placement of equipment directly above other elements of a system (hot water tank, mechanical room for photovoltaic equipment, etc.) thereby reducing runs which may reduce commensurate installation and materials costs, and reduce transfer losses. Ideal exposure of photovoltaic and solar water heating panels is to the south and at an angle which maximizes the performance of the panels. Since the winter sun is available for a shorter time than in the summer, and is lower to the horizon, equipment performance is optimized when tilted at an angle that puts it perpendicular to the sun’s rays. This tilt angle has a direct impact on the output of the system. Summertime conditions are less a factor, primarily because there is so much sun for a longer period of time. 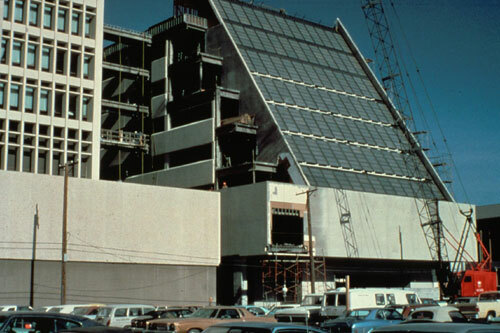 Many existing and new buildings are not properly sited for optimum south sun exposure, nor have roofs designed and constructed with proper tilt angle orientation to the sun. 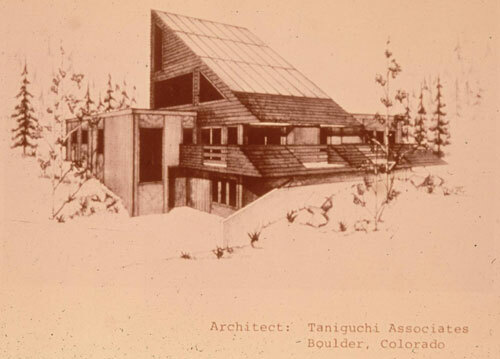 Some have no tilt at all, incorporating the prevalent Santa Fe flat roof style. These conditions force owners to live with, or mitigate negative conditions. Equipment can be placed on roof-mounted racks which place panels at the correct orientation and angle to the sun. Rack mounted panels can be used to mitigate conditions of poorly oriented roofs; roofs with improper tilt angles, and flat roofs. While effective in providing proper conditions for equipment performance these installations are perceived as unsightly and incomputable with the building design, and have been the crux of recent conflicts between homeowners and their Home Owner Associations (HOA). 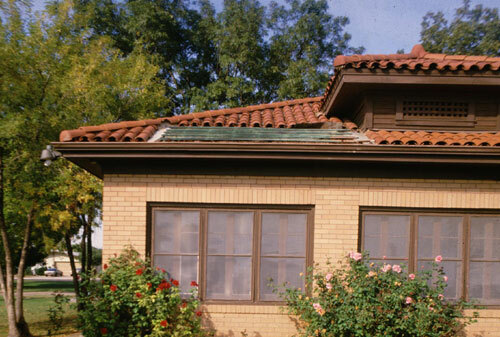 While Arizona courts have made judgment in favor of the homeowner in this conflict, the fact still remains that some rooftop solar installations still have the issue of visual incompatibility with the building form and design. In order to address the issue of visual discontinuity and intrusion, some installations have incorporated screen elements which prevent viewing the equipment and racks. While screening can be executed in a manner to blend with the building architecture in flat roof situations, it is much more problematic in pitched roof and poor orientation conditions. 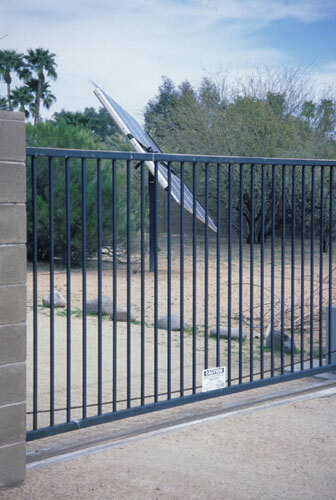 Screening and other such visual barriers must be large enough and spaced from the equipment sufficiently in order to minimize shading which negatively impacts performance. 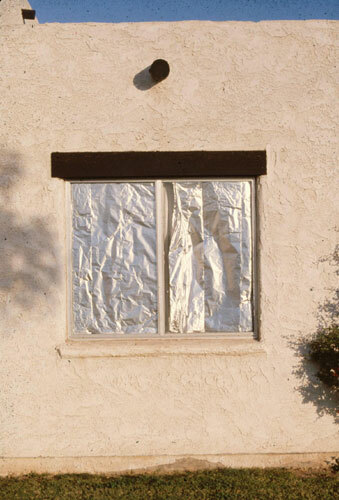 The addition of visual screening also adds cost to the solar installation. 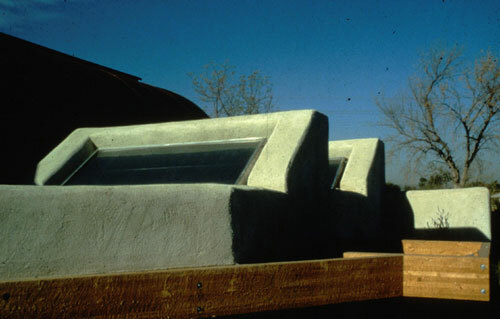 Equipment can be placed flush to existing roof slopes in order to provide a compatible installation with the building’s architecture. These installations can incorporate trim, which visually integrates the equipment into the roof structure. 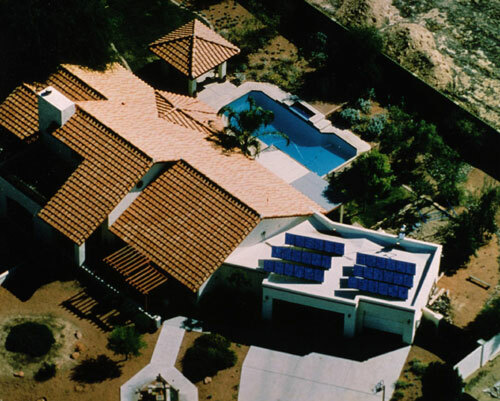 Arizona owners and contractors have successfully installed solar equipment that is visually compatible with existing roof pitches and materials, and having the aesthetic impact equivalent to a skylight. While effectively providing visual compatibility, such placements result in less than optimal performance of equipment due to less than ideal orientations and exposure to the sun. Combining building form and optimal functional requirements of solar strategies and equipment, this approach integrates solar equipment and strategies as a part of the building fabric and architectural expression and design, sometimes coupling multiple energy and resource efficiency strategies. 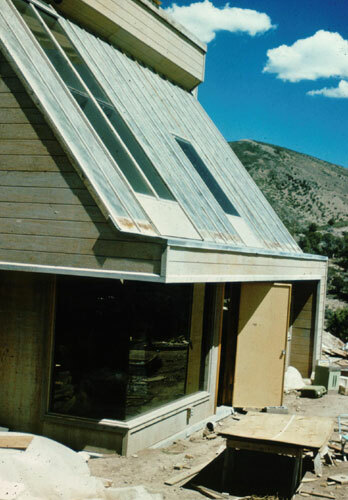 The building planning, design and construction provide appropriate conditions for energy efficient operations and integration of active and passive solar equipment. An integrated solar energy building incorporates ideal conditions for both passive and active solar applications, from space heating and cooling to power generation to incorporation of solar hot water systems. Integrated energy buildings, and building elements, are correctly located in terms of orientation, and exposure to the sun and correctly structured to provide appropriately angled roofs and elements for optimal solar equipment performance. Additionally, an integrated solar energy building is one that evolves its design and expression - its character and style - from the attributes of its solar (active and passive) and energy characteristics. 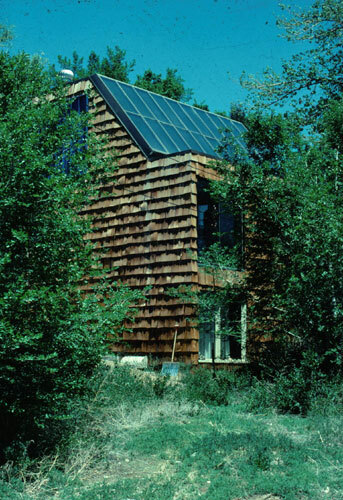 Integrated systems solar buildings vary in execution and expression, even while maintaining common attributes and premises related to environmental conditions and resources in both passive and active solar applications. 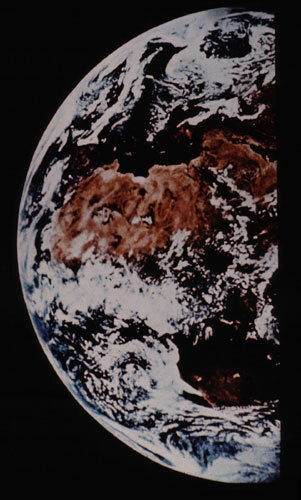 Orientation to the south allows for use of the sun for passive heating purposes in cold climes and for mitigation of negative west and east sun heat in dessert conditions. This is also an ideal condition for solar equipment performance. 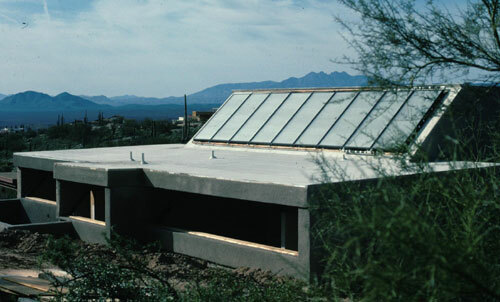 In some projects, south facing roofs are angled to appropriate tilt angles and equipment is mounted directly as another “skin” to the building fabric. It is known that an array of PV panels tilted to the sun produces over 50% more electricity than one which is simply vertical. 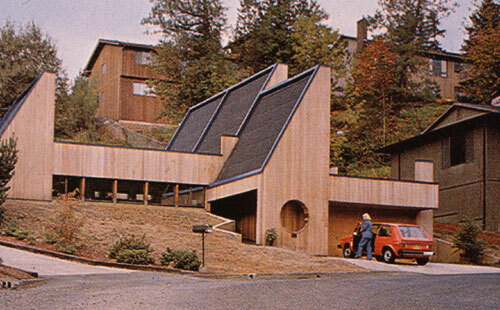 Collectors, whether water heating or photovoltaic, become one with the building form and expression. New developments in photovoltaic systems are bringing panels that both generate electricity and are part of the roofing system. This dual function application easily incorporates to solar building design and construction that provides appropriate roof pitches for optimum solar exposure. 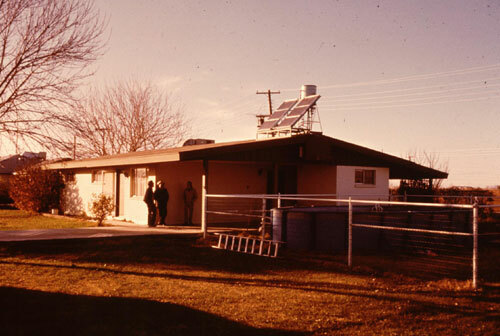 The photovoltaic system, a solid state semiconductor technology converting the sun’s energy directly to electricity, without moving parts, making noise or making emissions, is developed as a Building Integrated PV system which integrates this technology into the building construction, sometimes replacing or integrating with existing construction materials that form the building’s exterior “skin” - i.e. 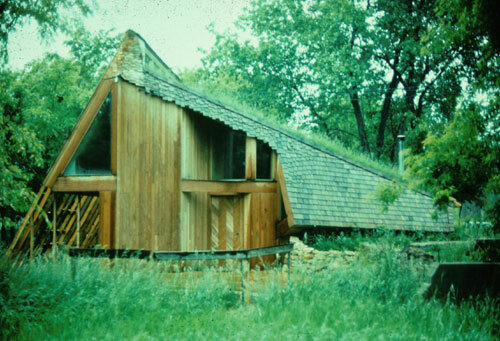 the roof or wall system. The PV system then becomes a dual-purpose element, not only generating electricity for the inhabitants but also acting as the roof and/or wall of segment thereof, of the building. Appropriately oriented and pitched roofs are also compatible for inclusion of solar hot water panels that benefit from ideal exposure and placement and benefit the building design with integrated design elements much like skylights add visual interest to roof lines. 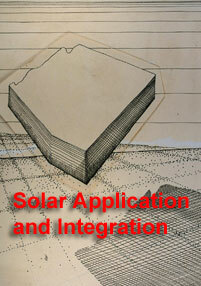 Not all integrated energy applications must encompass entire roofs on a monolithic building block. Buildings derive aesthetic interest from their component elements like clerestorey windows, chimney structures, overhangs and facia designs, and from building massing and variations in wall planes. 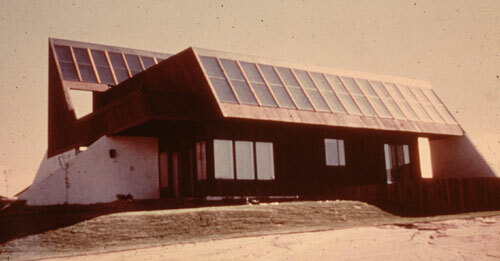 The integrated solar energy building incorporates solar equipment and applications into this scale of building element. A north facing rooftop clerestorey windows can provide the structure for south facing solar equipment on the back side, thereby combining two functions - one of introducing daylight - the other of producing hot water and/or electricity, within the same structural element. it provides an interesting and dramatic building design element. 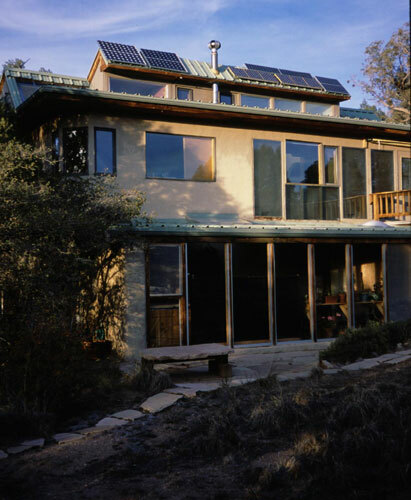 Examples of element/solar integration is the placement of photovoltaic panels as a part of the building eave system, and the integration of water heating solar panels into a south wall. Multiple functional building elements is a strategy that lends itself to solar installations in existing buildings. While it may not be desirable to incorporate a solar device into an existing building fabric because of renovation costs, it may be quite feasible and desirable to do a single modifying action that has multiple applications including solar. Besides improving functionality to a building, the multiple energy/solar modification pays for itself with savings that is realized in energy efficiencies, and in savings realized in the use of solar equipment. 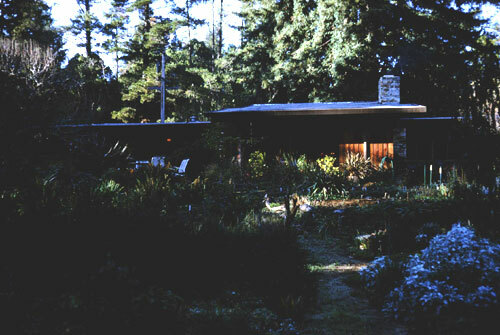 It is a modification that will pay for itself in energy saved and in the increase in property value. Solar applications are a growing reality in the building landscape. Traditional perceptions of aesthetics, appropriateness, and value are changing in response to the realities of energy and environmental considerations, need for energy security, and desire for energy stability and self-sufficiency. Buildings are incorporating environmental design strategies in response to site conditions, and available natural resources, and are incorporating solar equipment and devices, which impact building design and construction. Buildings that integrate solar attributes and equipment define themselves in a form and expression that reflects local conditions and resources. 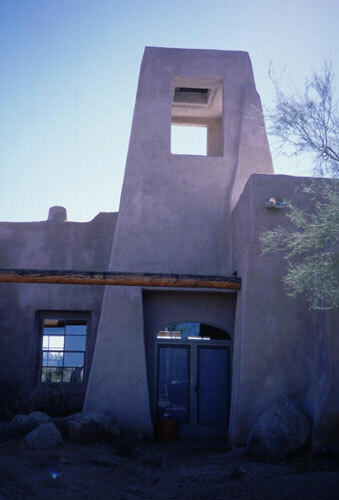 The careful and considerate integration of solar, energy and environmental elements into the building, whether existing or new, is a benefit that manifests itself as the basis of a truly indigenous and local architecture (images below are examples).